A Merry Christmas was had by all. Santa left the kids a long letter, and a special gift for each one under the tree. Z was a maniac. He loved everything he opened, and represented the true magic of Christmas morning. Belle got exactly what she asked for, down to the letter. All I asked for was for her to stay a little kid longer. Adam was surprised to get what he asked for, we saved it for last( i don’t know why parents try to be so tricky and terrible…we just do) He CRIED. Don’t tell him I said that, it was nice to see a truly grateful heart in a 12 year old body. And Sidney, well, Santa managed to pull out a nice surprise for her too, even though he wasnt quite sure where she was going to be( he is good that way). 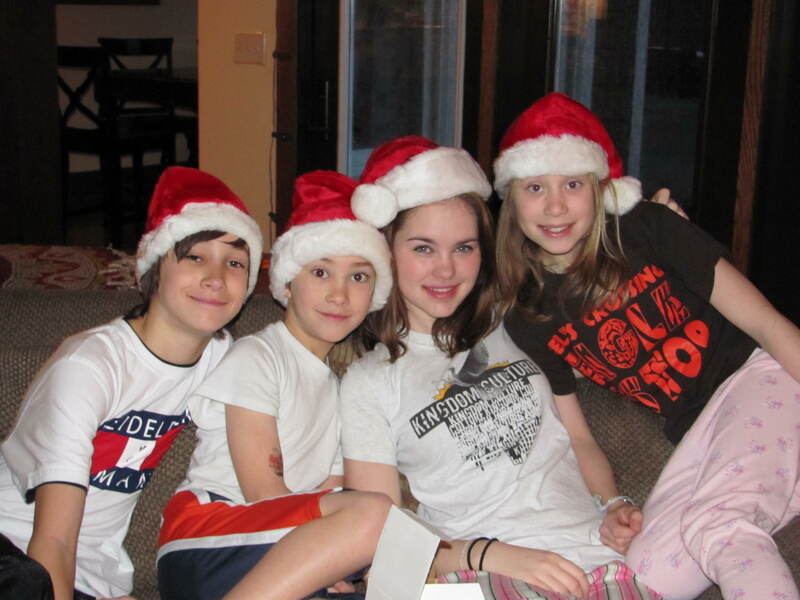 The butcher had all he has ever wanted…..sitting on the couch wearing santa hats….his children, all of them. And socks, of course. I asked for peace, and I had that. It was a lovely Christmas for us all. « The only thing missing was a fatted calf…..